What type of piano learning software do you need when you learn to play the piano? Here are my recommendations of really helpful music and piano software for adult beginners that can assist you in different areas of your piano study. Do You Need Piano Learning Software to Learn Piano? Nope, you don't need any software to learn how to play at all! So why recommend it? And if it is fun and challenges you in different ways- why not? Just keep it real- use music software as a tool, but don’t rely on it for all your needs when learning to play. (See my caveat recommendation below). So, let's take a look at my recommendations of little goodie-boxes of piano learning software that can help you have more fun while learning to play the piano! Including all this and more, is a very affordable piano lesson software with a sound pedagogical approach, called eMedia Piano and Keyboard Method. This is a piano learning software that actually teaches you to sight read music better (!) as well as teaching you piano from scratch up to an intermediate level. 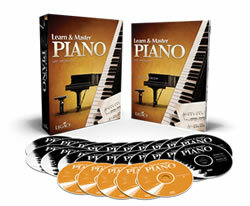 Another option instead of piano learning software, is a DVD lesson course package. 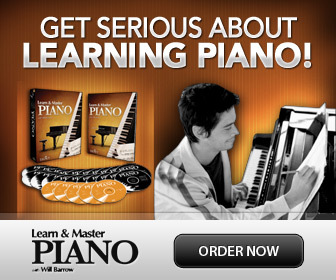 One of the most recommended all-around piano lesson software and video courses today is Learn and Master Piano. I like Learn and Master Piano , for the high quality and varied lessons. It is an interactive piano course package with DVD's, CD's and written instruction package. This ambitious program is demanding but provides you with many, many lessons. It will teach you a variety of styles, from Classical to Rock and is aimed at beginners through late intermediate levels. This online piano course is a great option when you want to teach yourself piano, but also want professional guidance. The well knows "Dummies" series also have a fun piano learning software for beginners called "Piano for Dummies". It is very popular and has gotten really good reviews. Check it out here: eMedia Piano For Dummies Deluxe. When you learn to play the piano, and especially if you teach yourself, you need to work on several areas, like music theory, note reading, ear training, etc. Proper piano technique can not be learned only with piano software. You need "the human touch". You need to study pianists and their technique, and preferably have a knowledgeable mentor/teacher at least once in a while to check you out. You need to actually see, do, feel, observe and evaluate to learn proper piano technique. Music Ace is by far the best software for learning music theory and note reading. Although for kids, it works for adults too. This software is super fun and builds your music theory skills step by step in a very thorough way. I have used it successfully in my studio for many years. And it's great for both adults and kids! This is an interactive music theory software for beginners through intermediate (430 lessons) that also has basic ear training included. Perfect for adults learning about music theory and how to play the piano and read sheet music.